Jenny here, I'm back and gatecrashing the Butterfly Reflections Ink blog for today only. 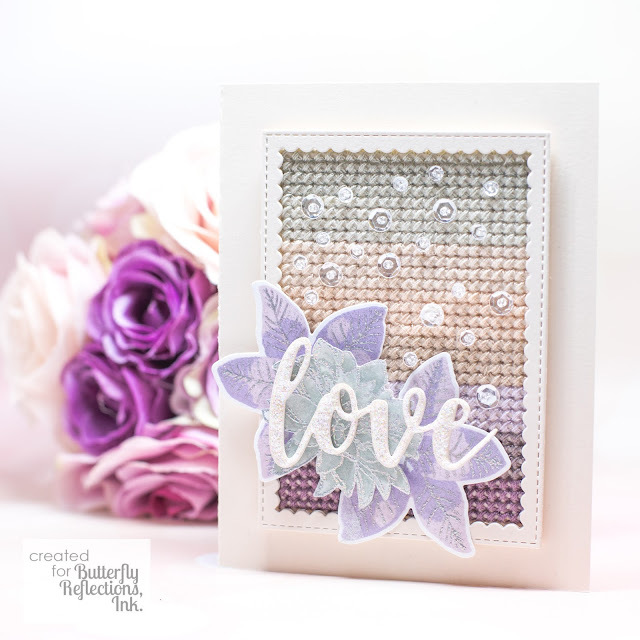 I've got a fun card showing you how you can use one of the fab Paper Smooches cross stitch dies along with some stamping. It takes a little effort but it's so fun! 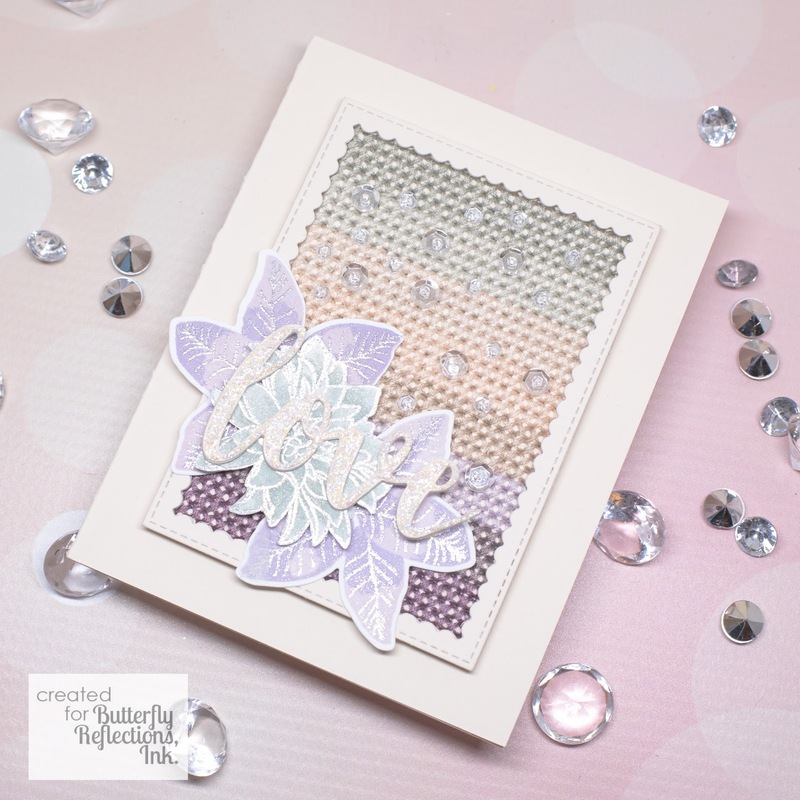 To create my card, I used the Paper Smooches cross stitch die to cut an A2 sized panel of thick (110lb) pale grey pink cardstock. I die cut it in the centre. It's important to use thicker cardstock for this as it makes it much easier to stitch. I then used a variety of DMC embroidery floss (6 strand skein) to stitch the panel. I used a tapestry needle and 4 strands to stitch the panel, changing the floss colour every 4 lines of crosses. You can create fantastic patterns with this die, but I wanted to do something fairly simple. When I completed the panel, I trimmed it down around the edges (don't cut any of the thread!). I then die cut the same colour card and a piece of craft foam using the My Favorite Things Stitched Scallop Rectangle frames (I've linked to similar frames here, mine were slightly different). I adhered them together with liquid glue and then onto the cross stitch panel, and set aside. On some Bristol Smooth cardstock I stamped the leaves from the Altenew Gardenia stamp in dark and light purple dye ink. For the veins, I heat embossed with Versamark using WOW! Cloud 9 embossing powder and die cut them out. I also heat embossed in Cloud 9 the smallest flower from the Altenew Blooming Bouquet stamp set, and watercolored it with Distress ink in Bundled Sage. I then fussy cut it out. I adhered the leaves with glossy accents to the base of the panel and popped the flower up on foam tape. 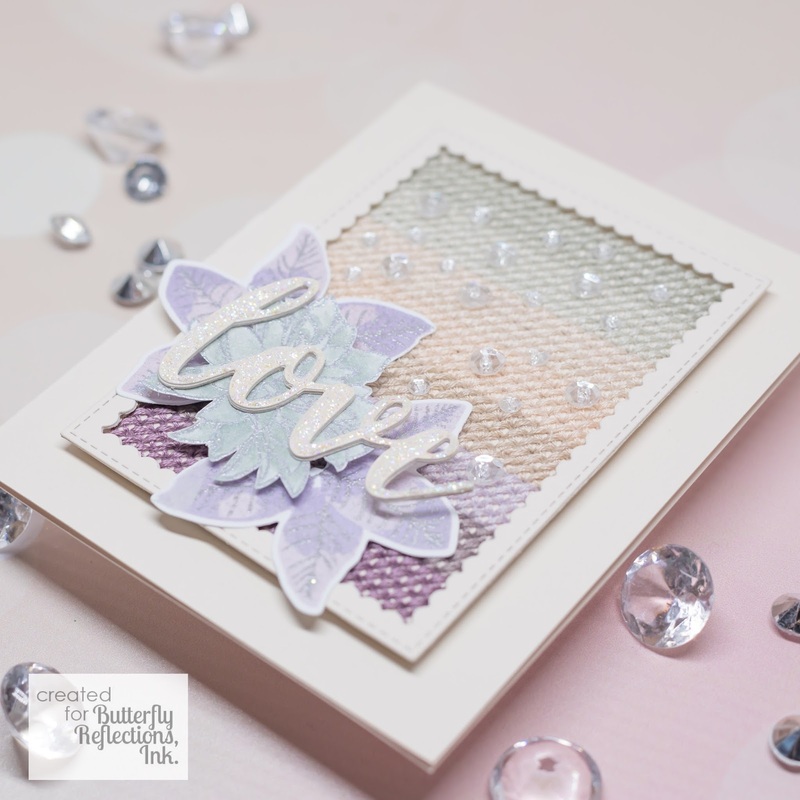 The love sentiment is by Altenew (Script Words) die cut from the same cardstock and coated in Crystal Stickles. While the stickles dried, I added 6mm and 4mm sparkling sequins by Pretty Pink Posh , secured with embroidery thread and a sparkling clear seed bead. If you pass the needle up through the sequin and bead, but only back through the sequin (same hole), the bead will prevent it from coming off. I then adhered the entire panel to a matching card base, and adhered the sentiment. And that's it! Hope you like it. I strongly urge everyone to get these cross stitch dies, particularly if you like stitching, but even if you've never tried it, it's really fun to play with and learn!